The population estimate found that the carp population is too large to sustain without negatively impacting water quality. Harvesting carp can help improve water quality and clarity in the lakes. The carp tracking has identified locations where they congregate, and commercial fishermen will harvest enough fish to bring them down to a manageable level. That harvesting would likely be in early 2018. Later in 2018 there will be a followup carp population estimate to determine if the biomass density goal was met. The carp tracking has found that the fish are moving into and out of the lake system, although probably not in large numbers. However, harvesting won't have long-lasting benefits if even just a few get in. The carp management project includes installation of fish barriers at key locations to prevent this from happening. Potential locations include the France Avenue weir in Robbinsdale or at the outlet of Ryan Lake into a channel in Minneapolis just east of Osseo Road, and two culverts under County Road 10 on the north end of Upper Twin. These culverts lead to wetland complexes north of CR 10 that could also be potential spawning locations. As water clarity improves, aquatic vegetation growth will likely increase. Shallow lakes such as Upper Twin are vegetation-dominant, and the plant roots play an important role in stabilizing sediment There are native species in Twin Lakes, but there is also Curly-leaf pondweed present. To reduce the biomass of Curly-leaf and to prevent its spread, chemical or mechanical treatment will likely be necessary. 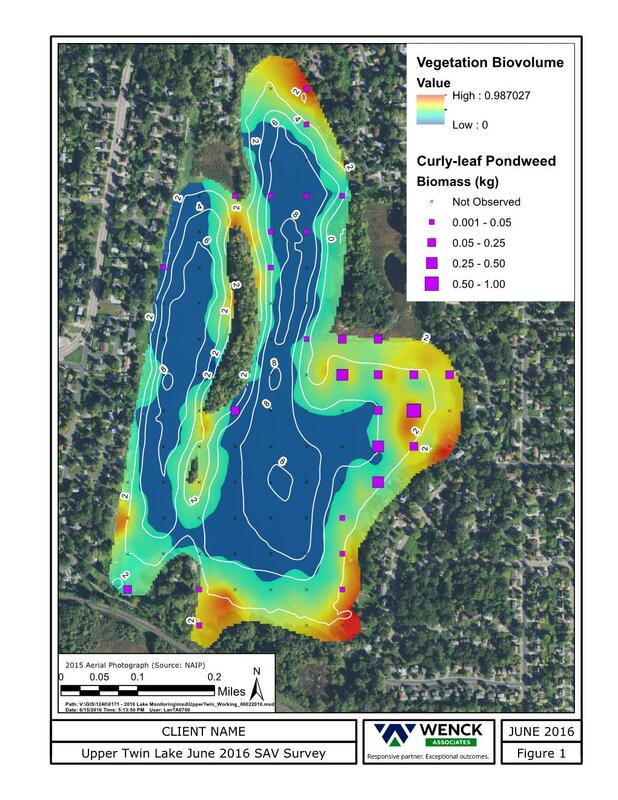 The aquatic vegetation management plan is part of this project, and the Commission is working with the DNR to determine the most likely vegetation response and the appropriate treatment. Upper Twin and Ryan Lakes have experienced several fish winter kills when dissolved oxygen in the water beneath the ice falls too low to support life. Species such as bluegill are especially vulnerable to low oxygen conditions. Bluegill prey on carp eggs, and keeping a healthy panfish population is essential to keeping carp from successfully reproducing. these two lakes may require winter aeration to maintain a zone of well-oxygenated water where fish may take refuge.